France has begun an operation to push back rebel forces in Mali. A state of emergency has been declared throughout the country. "French forces brought their support this afternoon to Malian army units to fight against terrorist elements," French President Francois Hollande said in a statement. "This operation will last as long as is necessary." On Friday France began air strikes against the rebels. 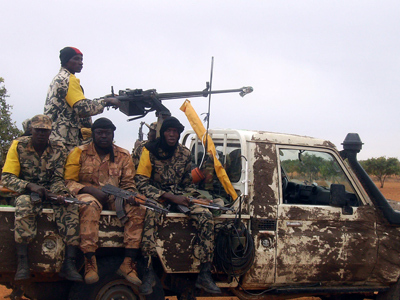 Backed by international forces, the Malian army was able to stop the advance by the Al-Qaeda-linked militants and recapture the key town of Konna, which had been seized by insurgent forces earlier, said the country’s defense officials. Britain supports France's decision to intervene, UK Foreign Secretary William Hague said in a message on Twitter. A source at Sevare airport, located 40 miles (60 km) south of Konna, told Reuters that around a dozen war planes had arrived on Friday. Residents of the city also said that Western soldiers arrived late on Thursday, and reported the arrival of military helicopters and army reinforcements. "Helicopters have bombarded rebel positions. 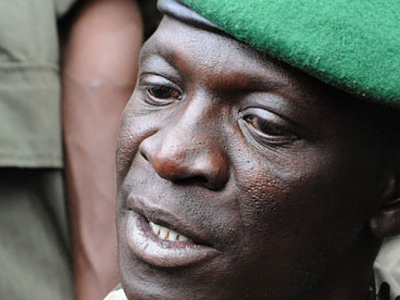 The operation will continue," a senior military source in Bamako said. Earlier Friday, Hollande vowed to stop the advance of al-Qaeda linked rebels who control northern Mali and have headed south in recent days. 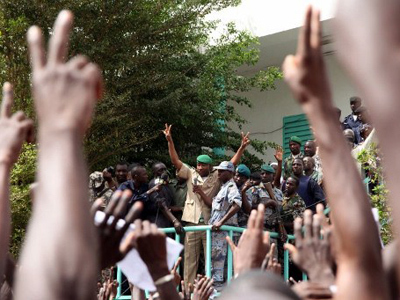 In a speech to France's diplomatic corps, the leader said he was ready to respond to Mali's call for help. 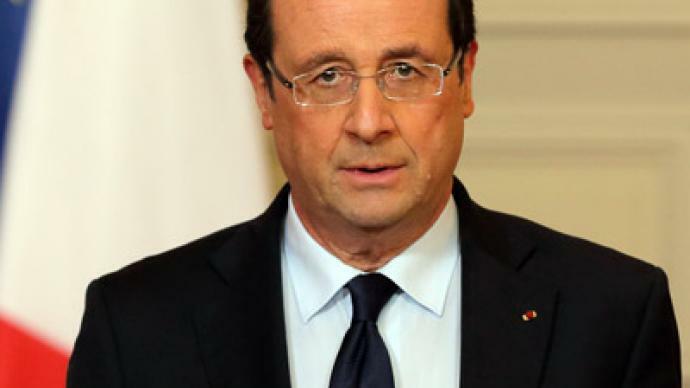 "is prepared to stop the terrorist offensive,"
Hollande said. He did not provide any specific details. It comes just one day after Hollande's Malian counterpart, Dioncounda Traore, sought help from France in order to stem the rebels' advance. The two leaders will meet in Paris on Wednesday, a French diplomatic source told Reuters. 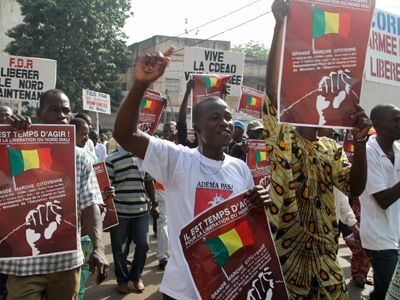 The UN Security Council has also called for a 'swift deployment' of foreign troops to Mali. It has approved plans to send some 3,000 African troops to recapture the country's north. Nigeria and Senegal are also providing assistance to Malian government forces. Until now, France and other EU nations have limited their plans for assistance, offering only training and logistics to support Mali's army. Meanwhile, France's Foreign Ministry has issued a travel alert for Mali, advising its residents to leave the country. "Due to the serious deterioration in the security situation in Mali, the threat of attack or abduction is growing," the ministry said. "It is strongly recommended that people avoid unnecessarily exposing themselves to risks." 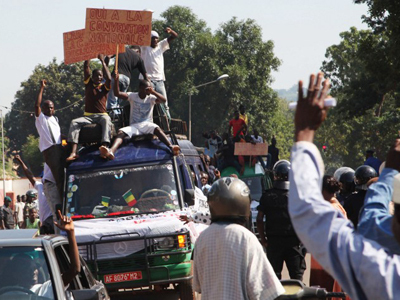 Extremists, which have controlled the country's north for months, captured the city of Konna on Thursday. "We are actually in Konna for the jihad [holy war]," spokesman for the Ansar Dine militant group, Sanda Abu Mohammed, told AFP. Ansar Dine and Mujao have controlled most of northern Mali since last April. They formed an alliance with Tuareg rebels following a military coup in March. However, their alliance quickly collapsed, with the Islamists capturing the area's urban centers and marginalizing the Tuareg rebels. The Islamists have been accused of war crimes and attempting to impose strict Sharia law throughout the region, harboring fears that the area could soon become a hub for al-Qaeda linked militants. The rebels are currently threatening the take over the city of Mopti, which would leave the capital Bamako more vulnerable. Abayomi Azikiwe, editor of the Pan-African News Wire, stressed in an interview with RT that there is a lot of US and French involvement in the crisis. He noted that Mali’s interim president, Dioncounda Traore, has close ties with the United States and was installed by US-trained Captain Amadou Sanogo, who led last year’s coup d’état. Jeff Steinberg, senior editor of the Executive Intelligence Review, believes France should be blamed for the unrest in the African country, linking the rebellion in the northern Mali to the fall of the Gaddafi regime in Libya. “The rebel operations in northern Mali have existed for quite some time, but it was only in the aftermath of the overthrow of the Gaddafi government in Libya – which was promoted by France, Britain and the United States in particular – it was only after that that you had a massive flow of weapons out of Libya into the hands of the rebels, which basically took a low-intensity conflict and threw it into a much greater crisis where the rebels outgunned the Malian army,” Steinberg told RT.